The first unmistakable sign of climate change Patrick Gonzalez ever saw in the field was in Senegal. It was a dead tree — Prosopis africana or, as the locals call it, yir — normally a mid-sized tree with tiny bluish-green leaves and wood so dense that Wolof villagers use it to hold up the walls of their huts, passing the poles down through the generations. But this yir was nothing but a gray naked trunk, and Gonzalez knew that climate change had killed it. Five years earlier, when he first came to Senegal as a Peace Corps forestry volunteer in 1988, village elders told him that many local trees were dying off — including yir, mango, cashew and jujube, whose berries are full of vitamin C. Their loss contributed to the people’s obvious malnutrition — toddlers with hair of a dull reddish hue instead of shiny black, tragically skinny adults. Women were forced to walk much farther to gather firewood. Gonzalez helped them revive forgotten traditional methods and re-grow some of their native trees. But he was also determined to figure out what was causing so many trees to die. So he returned to Senegal in the early 1990s and walked to 135 villages to count and measure trees and interview village elders. He wore out six pairs of tennis shoes walking nearly 1,200 miles — and earned his Ph.D. from the University of California, Berkeley as a forest ecologist, and his stripes as a climate change scientist. A quarter-century later, Gonzalez is focusing his considerable passion for deciphering how climate change is altering the natural world on some of America’s most cherished landscapes: the national parks. It’s melting glaciers, hastening snowmelt, intensifying wildfires, warming streams, and pushing animals and plants out of their usual locations. In coming decades, climate change will magnify these impacts. To what degree depends on whether and how much people rein in greenhouse gas emissions. 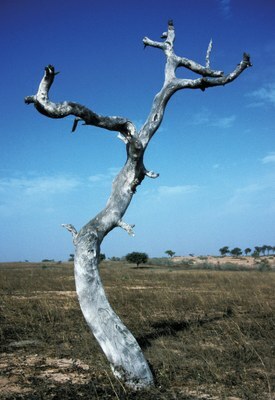 A dead yir tree in Senegal, seen by Patrick Gonzalez in 1993 as an unmistakable indication of climate change. As in Senegal, Gonzalez’s mission is twofold: He’s leading a massive effort to analyze and describe climate change impacts in every park and across the whole system, and with colleagues inside and outside the agency he’s pioneering ways to use that science to preserve the landscapes that first inspired Americans to create national parks. Climate data can help park supervisors make decisions about everything from how to manage wildfires and restore wetlands to how — and whether — to upgrade culverts or move roads. Patrick Gonzalez, right, and his best Wolof friend, Séex Ley, check the “sowing bags” that contain seeds that have yet to sprout. As a Peace Corps volunteer, Gonzalez innovated new ways to grow native trees in an environment that was becoming less hospitable to them. Gonzalez, a trim 51-year-old with short salt-and-pepper hair, regularly walks 10 miles a day. He literally bounces up steep trails in Yosemite, stopping periodically to admire new spring growth on pines or sniff their bark, talking all the while. There’s a kind of quiet ferocity to the man, especially when it comes to climate change. An introvert by nature, he acquired the gift of gab from the Wolof villagers, who welcomed him when he showed up unannounced, wanting only his conversation. He owes to them his rare ability to communicate the truth about climate change. He drives himself and his colleagues to combine the latest international climate data with contemporary field observations, as well as the national parks’ rich trove of historical research. That has given the National Park Service a major head start over other federal agencies, says Kathy Jacobs, who worked in the Obama White House for four years producing the 2014 National Climate Assessment. The other dozen agencies involved in that report “were more reluctant to use this information or didn’t know how to translate science in ways that are useful for decision making,” says Jacobs, now a University of Arizona professor and director of its Center for Climate Adaptation Science and Solutions. Gonzalez serves all the parks, but Yosemite has been his personal favorite since he woke up in a tent in the valley on a snowy morning, 29 years ago. This May, as he headed back there from his home in Berkeley, California, he was full of excitement. He was about to introduce managers from several West Coast and Pacific island parks to his strategy for better managing forests in the face of the increasingly frequent fires that climate change brings. But before reaching Yosemite, Gonzalez was jolted by a sight reminiscent of his experiences in Africa. He knew that California’s four-year-drought had killed trees, but was unprepared for the profusion of rust-colored dead trees on a landscape he loves so deeply. A wave of shock and sadness swept over him. “I was alarmed, actually,” he recalls. “It’s preventable,” he says of the tree losses around the state. “Human climate change has caused a tenth to a quarter of the California drought.” The Sierra Nevada’s dead trees are part of a West-wide die-off. Climate change caused tree deaths to double between 1955 and 2007, research shows. Scientists haven’t yet analyzed the role climate change played in the even larger die-offs of more recent years. As in Senegal, that knowledge motivates Gonzalez to act. Now he and his colleagues are using careful, inventive science to prove that climate change is to blame, communicating that fact to the public and devising management changes that reflect the data. Gonzalez looks for overarching patterns. For instance, his analysis shows that climate change is heating up national parks on average three times faster than the rest of the country. Parks tend to be located at higher elevations and farther north, where temperature increases are greater. The increases vary significantly, park by park. But national parks serve as crucial safe havens: As lynx, wolverines and other high-elevation mammals are pushed into ever-smaller areas, their remaining habitats, often in parks, become increasingly important to their survival. He’s also parsing the latest climate data and synthesizing studies to draw individual portraits of climate change in each park, now and in the future. So far, he’s completed reports for 234 of the 412 national parks. They provide specific data tailored for each park about historic temperature increases and precipitation changes, as well as a range of projections. For coastal parks, they also include historic data and projections for sea-level rise, erosion and storm surge. But the reports also provide much more intimate pictures, capturing the vulnerability of particular animals and plants, as well as impacts to glaciers and other natural wonders. “The Park Service should be applauded for really drilling down and trying to understand how each unit will be affected,” says Jonathan Overpeck, professor of geosciences and atmospheric sciences at the University of Arizona. The sea-level rise and storm surge data come from a major project by University of Colorado climate scientist Maria Caffrey, which examines all coastal and lakeside parks. Gonzalez, who oversees Caffrey, had her recalculate her data using a different measurement technique, to make it more useful for park managers. Despite the inordinate amount of work that caused her, Caffrey says she appreciates his high standards: “Patrick really is the only person at the Park Service I can think of who will dive into the numbers and think about things I haven’t taken into account.” So far, two parks have resisted Caffrey’s projections because they didn’t jibe with their own estimates. But Gonzalez stepped in, insisting they use her conclusions because she used more accurate, up-to-date science. Patrick Gonzalez, principal climate change scientist of the National Park Service, measures a ponderosa pine in his favorite national park, Yosemite, where he sees first-hand the effects of climate change. While the Park Service has progressed light-years in terms of conducting climate change science, individual parks have moved much more slowly to incorporate that science into management. Agency veterans say the pace is intentional and reflects past experience, when hasty management changes backfired. For Gonzalez, though, the speed sometimes feels frustratingly slow. He remembers how, in just two years, he was able to devise ways to help remote villages in Senegal regrow the trees people needed for their health and livelihoods. To protect young trees from livestock, he resurrected a traditional practice of surrounding them with hedges intertwined with thorny branches. One of Gonzalez’s proudest moments came when he returned to his Senegalese village this March: A happy farmer showed him 314 trees, jujube and others, planted with seeds that Gonzalez had given him. But getting the Park Service to adopt such innovative ideas isn’t always successful. Several years ago, Gonzalez was part of an effort to incorporate climate science into an update of fire-management policy at Sequoia and Kings Canyon national parks. That project fizzled. Last year, working with Bureau of Land Management and Forest Service officials, Gonzalez used climate change data to create a proposal to use Land and Water Conservation Fund dollars to buy private land adjacent to Redwood National Park and Whiskeytown National Recreation Area and other protected lands in Northern California. The parcels were important safe havens for animals and plants, home to trees that store a lot of carbon or vulnerable due to climate change. But the proposal wasn’t selected for funding. That makes him all the more pleased that managers at Yosemite, Grand Canyon and some other parks are now eager to integrate climate science into their decisions about when to treat landscapes with controlled fires and when to let natural fires burn. Scientists project that, by 2085, climate change may double or triple the area that burns each year in Yosemite. It’s already altering the three main factors that determine how often and with what intensity wildfires burn: climate, ignitions and fuels. Temperatures in Yosemite are increasing at a rate of 1.8 degrees Celsius (about 3 degrees Fahrenheit) per century, with the highest increases in the spring. That translates into longer fire seasons as the snow melts earlier. Lightning strikes that would have been snuffed out by snow now spark fires more frequently and at higher elevations. With hotter temperatures, fire-resistant red fir forests are moving farther upslope and being replaced by more fire-prone trees, such as ponderosa pine. That all adds up to more frequent, more intense fires. Other parks face even more daunting challenges. Steeper temperature rises in Yellowstone set the stage for “potentially astounding” increases in the frequency of fires, Gonzalez says; some scientists project that fires could become three to 10 times more common there by 2100. In Joshua Tree, invasive plants have brought fire to a landscape that did not evolve with it. The double whammy of fire and hotter temperatures could push the gorgeous, goofy trees out of the park named for them. Lyell Glacier, in Yosemite National Park, has retreated about 70 percent since John Muir discovered it in 1871. Several factors make him optimistic that Yosemite and other parks will embrace his new approach. The climate data, which were coarse several years ago, are now so detailed that Gonzalez can plot projected temperatures and precipitation for quarter-mile-square parcels of Yosemite. That’s fine-grained enough to guide a fire chief’s decisions about whether to set controlled fires or let natural fires burn. Key people are ready, too. Later, she strides across a stretch of ponderosa forest that her crew had burned a few years before. The trees are widely spaced, with blackened trunks and green canopies. “These larger trees won’t be destroyed by fire because there is nothing now to let a fire into the canopy of these trees,” says Martin. She wants to use low-intensity fires to clean out underbrush and small trees in large swaths of forests, thus preparing them to withstand hotter, drier conditions and wildfire. Gonzalez’s data will help her target prescribed burns and decide where to let natural fires burn. Her one worry is politics. It’s hard to get support to set fires when so many people view fire as always harmful. So when she learned that President Obama was coming to Yosemite, Martin hoped to light a controlled burn in the Mariposa Grove, the park’s largest collection of giant sequoias. Maybe Obama would watch it and use his bully pulpit to burnish fire’s image. “Think how powerful that would be,” she says. That particular burn didn’t happen, but Martin plans to keep working with Gonzalez to prepare Yosemite for the wildfires of the future. Yosemite Fire Chief Kelly Martin inspects a ponderosa pine in Yosemite Valley, burned in a prescribed fire. The evidence of climate change that Gonzalez has seen from Senegal to Yellowstone inspires him to encourage people to jettison fossil fuel-dependent lifestyles. He hasn’t owned a car since he returned from Senegal and avoids using elevators, even in skyscrapers. Walking the walk gives also him moral authority when he asks people to follow his example. Unlike many climate scientists, he’s extremely optimistic that people will do the right thing to slow climate change. Gonzalez imagines visitors learning about the parks’ vulnerability to climate change and deciding to make a difference by walking and taking public transit, not just in the park but when they get home, too. When Gonzalez was wrapping up his time at Yosemite, a family waiting for the same shuttle bus approached him. They had listened to his speech a couple of days earlier, and wished all visitors to national parks could be so lucky. “I would love it if we could just fill up the rooms every single day with the likes of Dr. Gonzalez, so he and people like him could say we need to change,” said the father, Franz Limonta. His 12-year-old son, Ansel, named after the photographer, chimed in, saying the family could drive less. Afterwards, they wrote Gonzalez to tell him that his lecture was the highlight of their vacation. They’re moving to San Diego and have already begun searching the internet for carpools, so Crystal Limonta, an ER nurse, can limit the greenhouse gas emissions from her new commute. 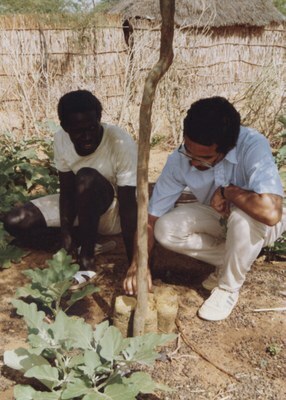 Native trees in Senegal today, grown by farmer Modu Jóob with seeds Gonzalez gave him decades ago.